Benchmarks were from Passmark and Userbenchmark. Of course, take these numbers with a little skepticism because (a) some users can see meaningful benefits in incremental improvements (b) some users don’t need (or aren’t capable of fully utilizing) a higher-end video card (c) different users use their video cards for different applications. Prices, of course, are flexible. 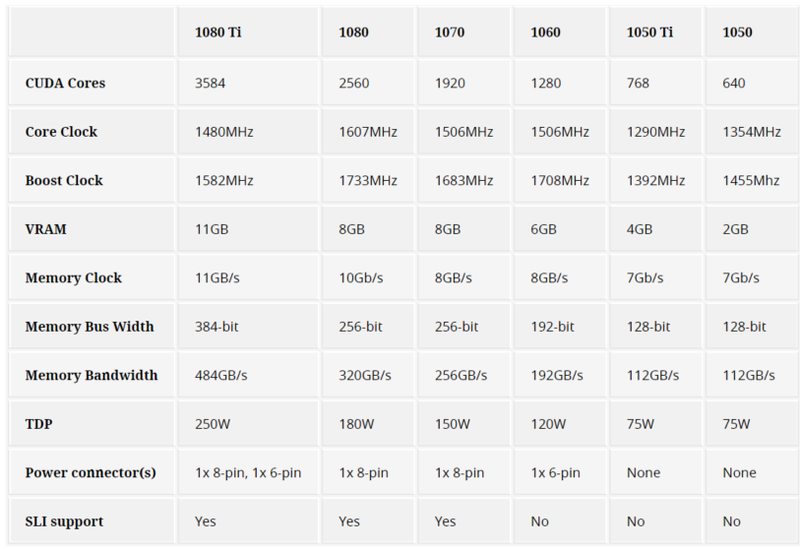 At the moment, 1050 and 1050 Ti are good budget options. The more close they are in price, the more the 1050 Ti makes sense. However, if you can afford to spend a bit more, the 1060 (3GB) offers the most bang for buck. The 6GB version of the 1060, as long as its well over $50 more expensive, offers diminished returns. While 1070 and 1080 once dominated the high end, the 1070 Ti offers the performance of a 1080 but at a lower price.